Note: Prospective docents (volunteer guides) can contact the Museum to schedule a free tour for themselves and their parents to consider the Docent Program. Call 814-466-9266 or email office@boalmuseum.com. Docents share a meal on the porch of the Boal Mansion with visiting French youths. High school students oftenlook for a community service activity to enjoy with their friends. One such activity is the Docent Program of the Columbus Chapel and the Boal Mansion Museum. Docents share the Boal Mansion's "Story of America" with museum visitors from around the world.To fill out an application form, click here. Who we are: We are the Boal family and their home, here for over 200 years and a community museum since 1952. We tell the story of our community to visitors from all over the world. It is the story of eight generations of Boals who helped found Boalsburg, Penn State and the 28th Division Shrine. We also show the Columbus Chapel, the most important Christopher Columbus collection in North America, imported from Europe by his Boal descendants. What you do: Students age 14 and older (some exceptions for younger students) apply (see below), and join a team of twelve volunteer tour guides (docents) we will develop for the summer. Email or telephone now (friends can apply together). Then contact the Museum and schedule to bring your Mom (and Dad, or come alone) for a special free orientation tour at a date and time that is mutually convenient. The next docent orientation session is scheduled for Sunday, May 5, 2013, 1:30 to 3:00 pm. for refreshments and a free tour. Parents are welcome to attend with the prospective student guides to learn about the program. Let us know if you would like to attend or just drop-in at 1:30 pm. 1) Learn to show visitors this unique community and international heritage. 3) Join in special events (see below) like docent parties, the Music at the Boal Mansion concert, the Boalsburg Memorial Day festival Monday, and the Columbus Ball. 4) Gain valuable experience in history, fine art and public speaking and meet young people visiting from France. 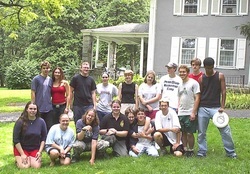 Boal Mansion Docents enjoy Ultimate Frisbee with Boal Barn apprentices and a couple of visiting French counts (standing, far left and second from right). Music at the Boal Mansion: fine food, champagne and music in May 2015. Boalsburg's renowned Memorial Day festival: food, music, crafts, on Memorial Day Monday, May 25, 2015 with music by many groups. The Declaration of Independence Garden Party in July 2015, celebrating Boal family ancestor Richard Henry Lee who offered the Resolution for Independence on June 7, 1776 and signed the Declaration of Independence of July 4, 1776. The Boalsburg Columbus Ball, celebrating Pennsylvania's unique connection with Christopher Columbus with contradancing, champagne and food on Saturday, Oct 11, 2014. Prospective student guides who cannot attend the scheduled orientation are invited to contact the Museum for a free docent orientation tour of the Museum. Contact the Museum at 466-9266 or office@boalmuseum.com. Are you a possible student docent? Submit your name, address, date of birth, phone and email address to the museum at office@boalmuseum.com or PO Box 116, Boalsburg, PA 16827 or telephone 814/466-9266. We will contact you to set up your visit to the museum to learn more about the Docent Program.